Tuguegarao City – Hon. Gina Lopez, former DENR secretary and now founder and chairman of the ILOVE (Investments in Loving Organizations for Village Economies) Foundation, met the different local officials, NGOs and cooperative heads, and several regional agency chiefs here in Cagayan Valley region on Friday morning, Apr. 27, 2018 at the Bulwagang Teodulfo Domingo, University of Saint Louis (USL). Earlier this April, Lopez, together with her private or implementing partners, the Social Economy Action Research (SEARCH) Foundation and Bayan Academy for Social Entrepreneurship and Human Resource Development, and government or strategic agencies such as the Department of Science and Technology (DOST); Department of Trade and Industry (DTI); Department of Tourism (DOT); Department of Social Welfare and Development (DSWD); Department of Public Works and Highways (DPWH); Department of National Defense (DND); and the Technical Education and Skills Development Authority (TESDA), recently launched “The Quest for Love,” a nationwide search aimed at transforming marginalized communities into localized economic zones which promote fisheries, agro-forestry and ecotourism. Lopez was scheduled for her multi-city roadshow to launch ILOVE’s Quest for Love, dubbed as “Kapihan para sa Bayan,” in Antique, Benguet, Cebu, Davao, General Santos, Koronadal, Legazpi, Mindoro, Sultan Kudarat, Surigao, Tawi-Tawi, and Tuguegarao, April to May of this year. “It is not about the money that makes the country great, it is the people. So we must love and take care of the people,” Lopez told the audience here. Her advocacy focuses on area development as she presented one of her projects, that in Kinatarcan Island in Cebu. “Love is an effort. It is a constant training. Now, tell me that love doesn’t work,” she said after presenting the success stories of her project through a video presentation. According to her, the people of Kinatarcan Island were diligently working together to better their lives as they continually live to their ideals and aspirations despite challenges and struggles that they are experiencing. 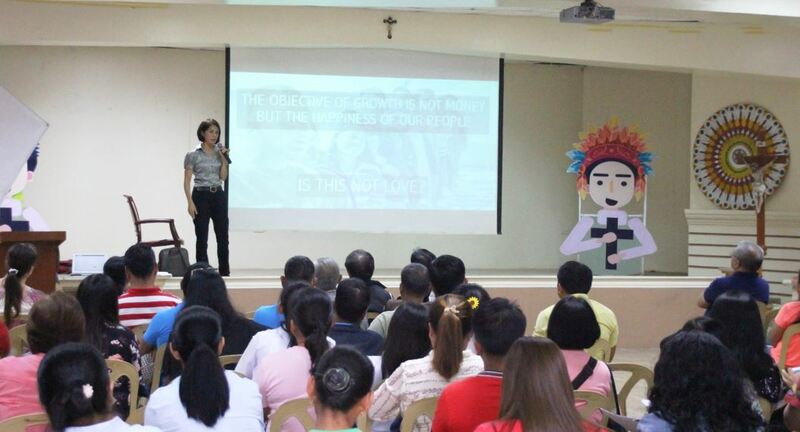 Lopez further emphasized that her project is not only about area development but also in uplifting people’s state of life and eradicating poverty in one community at a time. Her project in Kinatarcan Island offers life planning activities, survival training, and other physical fitness programs. Kinatarcans are likewise encouraged to be “sundalo sa kalikasan” (earth warriors). Meditation, team building and various livelihood training activities are also done to boost physical, mental and social aspects of the Kinatarcan people. Meanwhile, after Lopez presented her project in Kinatarcan, she discussed about ‘Quest for Love.’ She said that her project aims to look for 16 ‘loving’ organizations whose ultimate intention is to help people and communities in building multi-sectoral involvement for economic development that is premised on love and compassion. Said organizations can be social enterprises, cooperatives, NGOs, and other socially-oriented organizations that have done great accomplishments and contributions in developing local communities and uplifting people’s lives. From the different entries across the country, 16 organizations will become semi-finalists based on their track record, leaders, and the potential impact of the proposed intervention for their chosen community. Moreover, the chosen organizations will then partake in a four-day boot camp where they will undergo different training activities to hone their capabilities on area development and pitch their LOVE plans to a panel of judges. Top half among the 16 organizations will be selected and go through an eight-month acceleration program which will be shown on Lopez’ “G Diaries” aired over ABS-CBN this July 2018. An individualized mentoring by topnotch mentors and renowned entrepreneurs will also be conducted for the eight finalists. Among the pool of mentors are: Marvin Agustin, TV personality and owner of over 50 restaurants; Czarina Medina-Guce, a sociologist working on public policy, governance, and development issues; Ilac Ruiz, founder of the Liter of Light Global Foundation; and many others. The eight organizations will receive P100,000.00, valuable media mileage, direct access to government support programs, on-the-ground field support, access to a wide network of subject-matter experts, media exposure, and access to possible investors. By March 2019, the three organizations with the highest LOVE votes from the viewing public combined with the judges’ scores, will be announced as winners and will receive assistance from ILOVE Foundation and its partners for their projects. The event was also attended by Dr. Delailah B. Valencia, USL President; Dr. Rina M. Reyes, VP for Administration; Mr. Celso L. Tuddao, VP for Finance; Rev. Fr. Rex C. Salvilla, CICM, University CICM Liaison Officer; and other University officials and employees. Quest for Love (April 17-May 4, 2018). 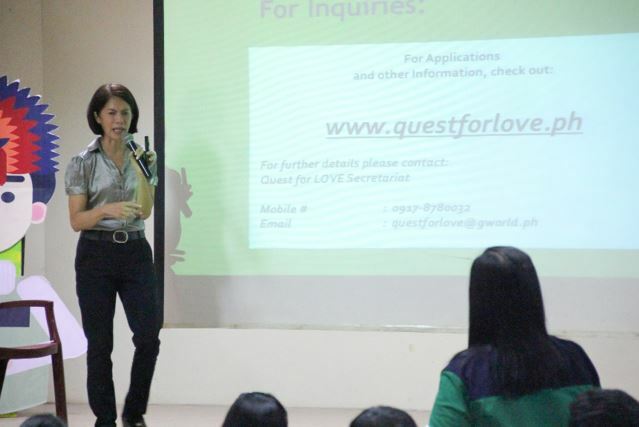 The Search has Begun: “The Quest for Love” Goes on a Multi-City Roadshow.